"You Might Even Say It Blows!" This holiday season has already yielded a few memorable moments in the world of pop music. A video uploaded by a New York radio station featured the rapper DMX singing “Rudolph the Red Nosed Reindeer,” yelping his way through the song—impeccably, without a lyric sheet—while his hands pounded a rudimentary beat. “You’ll go down in history—WHAT!” he barked at the end, throwing his hands up as if he’d just swooshed a half-court shot. 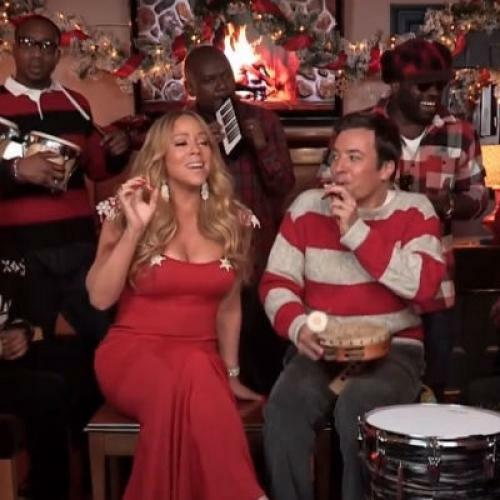 Then a video appeared of NBC’s Late Night host, Jimmy Fallon, with his house band The Roots, decked out in Christmas sweaters and holding toy instruments, crooning “All I Want For Christmas Is You” alongside its originator, Mariah Carey. But amid such festive, familiar tunes, recent years have seen a notable lack of new material. Each year, we feast on the same tropes—the Macy’s parade, the ensemble romantic comedies, the Christmas Story reruns—while pop acts reliably crank out versions of proven holiday standards. But where are all the new Christmas hits? Many of what we consider Christmas standards—“Have Yourself a Merry Little Christmas,” “The Christmas Song,” “White Christmas”—were penned between the 1930s and 1950s, during the Tin Pan Alley and Brill Building eras of popular music. But today new Christmas hits are rare, while the toasty old classics endure. Since the early rock and soul eras, pop producers periodically managed to introduce new Christmas songs into the canon: from the resplendent, such as Ellie Greenwich, Jeff Barry, and Phil Spector’s “Christmas (Baby Please Come Home)” in 1963, immortalized by Darlene Love, to the repugnant, such as Bob Geldof and Midge Ure’s U.K. single “Do They Know It’s Christmas?” in 1984. With its big, exuberant melody and its big, chimes-stuffed production, Carey’s “All I Want for Christmas Is You” was an instant yuletide classic when it was released in 1994. But since then, America’s pop cultural-industrial complex seems to have nearly abandoned the Christmas business. Or at least it has stopped trying as hard to compete. “All I Want for Christmas Is You” returned in 2010 and again in 2011 as a duet with Justin Bieber. “Under the Mistletoe,” Bieber’s 2011 collection of Christmas-season slow jams, landed at No. 1 on the Billboard albums chart—but only one of its six original ballads, the syrupy and paper-thin “Mistletoe,” co-penned with the Canadian production duo The Messengers, came within a sleigh ride of the zeitgeist..
December still sees a deluge of cash-grabbing holiday albums, but most are unrelentingly awful. Leading this year’s onslaught is Cee Lo Green’s “Magic Moment,” a collection in which the only original, “All I Need Is Love,” is a throwaway collaboration with the Muppets, and the album “Cheers, It’s Christmas” from country singer Blake Shelton, the centerpiece of which is a chintzy cover of Canadian kitsch-spinner Michael Bublé’s “Home.” Christmas releases by the pop-country act Lady Antebellum and the pop singer Christina Perri barely show signs of a pulse, with one unremarkable original each. Dutiful, nostalgic covers of old standbys—“I’ll Be Home for Christmas,” “Winter Wonderland,” “Let It Snow! Let It Snow!”—abound. The songs that have stuck around since the glory days of Christmas pop music to hinge on emotions more intense than mild nostalgia. A great holiday song needs a lot of things—a hook, a voice—but the most important is feeling: “All I Want for Christmas Is You” would never work without its unguarded enthusiasm. A song like “Christmas (Baby Please Come Home),” meanwhile, is powered by rawness and sorrow. Perhaps the only place where the Christmas song still thrives is an arena that should be allergic to its charms: that supposed hotbed of irony and subversion, indie rock. In 2010, Beach House released the gorgeously depressive free holiday single “I Do Not Care for the Winter Sun.” This year the orchestral indie-pop singer Sufjan Stevens released Silver & Gold: Songs for Christmas, Vols. 6-10, an attention-testing compilation of original holiday songs and fractured covers recorded between 2006 and 2012. It’s a warbly, frequently trying exercise—though when it gets noisy and transgressive, a rewarding one. At the very least, it’s taking a form of American vernacular music seriously while having some fun with it. In the age of irony, indie rockers may be the only musicians with no cultural cachet to lose when it comes to Christmas. If Christmas has been secularized to the point that its meaning has splintered, indie rockers are engaging with it in part to deconstruct it. The Magnetic Fields wrote a sardonic, slightly confounding Christmas song—with one verse in German—for a non-Christmas album in 2010. In 2004, the Walkmen released the inebriated, discursive single “Christmas Party,” which embraced the company of old friends and familiar songs only as a salve for being otherwise alone. These songs poke at Christmas from the margins, and yet most them end up telegraphing something earnest and true. Seven decades after Bing Crosby sang about a Christmas “just like the one we used to know,” our received notions of Christmas haven’t changed much, but our actual Christmases have. Today, as every new mainstream holiday song seems more terrible than the last, avoiding well-worn, supposedly universal sentiments may be the only way to make Christmas work. More often than not, that requires a shade of irony. In the pop-cultural imagination, we still gather around a hearth in the company of loved ones to be generous and merry, but it's a traditional and sentimental version of Christmas that doesn't appeal to the wider, more fractured popular culture the way it once did. Bubblegum artists like Bieber seem unable to crank out anything but the same old, corny tropes when it comes to Christmas. More postmodern ones like Lady Gaga regard the holiday as too wholesome and cheesy to waste a lyric on. They might cover an occasional holiday standard, but would either artist take an honest stab at a new Christmas classic? These days, not even with auto-tune. Jonathan L. Fischer is the managing editor of Washington City Paper. He tweets here.